Although STis have uprated engine internals they still need to be cared after in the same manner as the WRX motors. Oil changes should be carried out every 5,000 miles for Classics or 7,000 miles for newage, although more regular changes are not a bad thing, new spark plugs, brake fluid, transmission and diff oil should be changed every couple of years or 24,000 miles and the cambelt should be changed every 45,000 miles. Listen for knocking coming from the engine as this could indicate piston slap or bottom end damage and the turbo should run quite quietly if the cat is still in place. And last but not least, smoke free. Turbos must also be allowed to cool down after hard driving - ask the seller what he does for the shutdown procedure. Watch for a fluctuating idle which could be a symptom of a blown mass air flow sensor or sticking wastegate solenoids. If a boost gauge has been fitted, check that the boost pressure is not exceeding 17–18psi. The standard exhausts are fairly long lasting but most owners will have probably have replaced the original exhaust with a stainless steel aftermarket performance exhaust system, due to their performance and their very reasonable prices. Hayward and Scott to name just one. If the cat is removed on the Impreza you are looking at buying make sure to get the old cat from the seller, if it’s not available budget this into the price, as you will need one come MOT time. A powerful car with 4wd is always going to punish the gearbox especially so if it has been modified. It’s not uncommon for a clutch to last as little as 40,000 miles. Clutch judder is common on Classic’s when the car is cold. The Subaru gearbox is extremely tough but when the gearbox is warm do the usual checks to ensure that all gears engage easily with no crunching, listen out for any whining at all whether it be from the gearbox itself or from the diffs. Popping out of gear is almost unheard of, but accelerate hard from low revs in each of the gears to make absolutely sure. The OE brakes and pads are not amazing and most owners uprate the pads, discs, lines and fluid to uprated items. DOT 5.1 fluid is common, especially if your going to take the car on track. As with any car brake hard from speed to ensure the car pulls up straight and smooth with no judder. Rear brakes can seize if a car is left standing. Accident damage is a real possibility on these cars, vulnerable areas include the front end, front and rear wings. Check the underbody thoroughly for rust as a lot of car will not have been under sealed. The bonnet is also vulnerable to stone chips, budget the repair of this into the purchase price. The electrics are general sound although the cheap interior plastics can look tatty over time. The newage cars have better interiors however the seats become less ‘buckety’. Worn anti roll bar bushes can be diagnosed by knocking coming front the front suspension. It has been said that the best suspension available for the STi is it the original STi set up. So replacing does necessarily mean having to go down the performance suspension route although this may work out to be the cheapest option. If buying the older Classic shapes check the rear strut's more so if it's a UK car as they seem to rot/rust at the top around the bolts. good points there son. tho over the years i have found one common problem with the classics.check the rear strut tops as there seem that a lot of uk one have bad rot areas around the rear strut tops. Check the oil to make sure its oil and hasn't got anything else in it, like water/foam I checked a car recently and the dipstick was bone dry!! Check the rad to make sure it's got water in it and not mixed with oil. If you have any suspicions that the clutch may be iffy, here's a simple test you can do while accelerating from a stop. Put the car in first, accelerate to normal shift point (3k rpm is mine). Shift to second and go back to about 3250/3500 rpm. Instead of hitting third gear, try to put the car in 4th gear. Once it's in gear, floor the gas pedal. If the clutch is in good shape the car will kind of bog down and chug along as it picks up RPM then will come alive at about 2800 rpm and feel strong. If you put it in gear, floor it, and the engine seems like it's revving out and starting to really get going but the car is still sluggish and is not accelerating proportionally to the engine RPM....start asking questions, this is a sign of excessive clutch wear. I'd also add, assess the owner and his house not just the car. You'll get a good idea how he treats his car by looking at how he lives and acts and also by just talking to him. If something seems too good to be true be very wary. If something doesn't seem right it probably isn't. Buy with your head and not your heart. Try and see and test drive a perfect/excellent version of the car you are looking for before you start looking. You'll then know what one feels like to drive. Friend might help? Another thing to look out for is wear in the front CV joints. Easy way to tell is to open the windows and pull away from stationary on full lock with a bit of welly. Do this in both directions a few times. If they are starting to wear you will hear a distinct clicking noise. If they do it at low throttle then they need changing urgently. 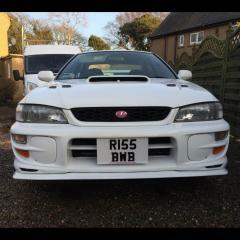 hi chaps im new to Subaru and to this site. does anybody know anything about break disc skimming ? Danboy does it do it at low throttle settings? You can try jacking the front wheels off the ground and giving them a good hard tug outwards. Sometimes it seems to reseat the CV balls and can stop the clicking but only if they are slightly worn. If they click at low throttle full lock then they are on their way out. Consider changing them or getting them overhauled as if one goes at speed it can lock the wheel which is not funny. Hi just a thought you give a good tug outwards, would that not show massive wear in the lower ball joint and front arm bushes if you pull the wheel outwards and it moves the cv joint. It sure would if they were that knackered but methinks you would have noticed other symptoms and various noises before then. I was given this tip by an old school mechanic and it worked on my Volvo T4. Apparently it works because the wheel is hanging and extends the splines inside the CV and by pulling ithe wheel it sometimes moves just enough to jiggle any grit or metal filings alowing the balls to seat properly. It is a temporary fix as the iCV probably has grit inside causing the balls to stick and wear excessively. What have you got to lose? You may get another few months or even years out of the CV before it wears too much and needs changing. Hi everyone, I'm in need of some help buying a 2010 legacy estate 2lt diesel with hi mileage(145k miles) that had an engine rebuild? normally I would not consider this but would like to own one. so what is the life of the engine/gear boxes as never see very hi mileage car for sale. and what other part may give problems. any pointers for inspecting this car would be greatly appreciated. other cars i'm looking at are the Honda accord tourer 2010 2.2d-tec(130miles), 320 2lt estate 2010 diesel(100miles), mazda 6 2010 2.2lt diesel tourer(100miles). I like the accord and haven't tried the bmw yet, most important thing is my need room in the back seat(for children)(I know that the subaru is tight in the back). Best advice is to put down a minor receipted deposit that's refundable on a good Subaru. If you want the car, go back the same day with the money to secure it "as seen" because some unscrupulous dealers and sellers will swap all their old crap bits onto the prospective car you'll be buying. If the car's not there the same day, get your deposit money back. As I found when overhauling suspension check inner rear arches suspension turret area. I believe all classics will be corrodeing around this area not fallible on mot due to visibility in this area but it's within 3-4 inches of suspension mounting and 8 inches of seat belt mounting. Just finished fabricating and welding new panels in mine. I am thinking of buying a automatic Forester are they a good gearbox and what is the life of the clutches? the car has done 56,000 miles, good owner not a boy racer, what do you think? If buying the older Classic shapes check the rear strut's more so if it's a UK car as they seem to rot/rust at the top around the bolts. Where abouts can you see the top of the strut? Or is it a case of check inside the wheel arch? Just done a bit more reading online and there are a few videos and such which say that piston slap on cold start up isn't a problem? And that only if it carries on when the engines warm that it's a problem? Also, (I could be completely mistaken on this one) that piston slap can be cured through a good map? And is there a way to test shocks without jacking the car up? A car that I'm going to look at on Saturday had a leaky shock back in September but seems to have been resolved while at the MOT but just want to check that the work has been carried out?